Kathryn Palmer-Wiegers' mural adds brilliant color to the side of Green Mountain Power's Energy Innovation Center. 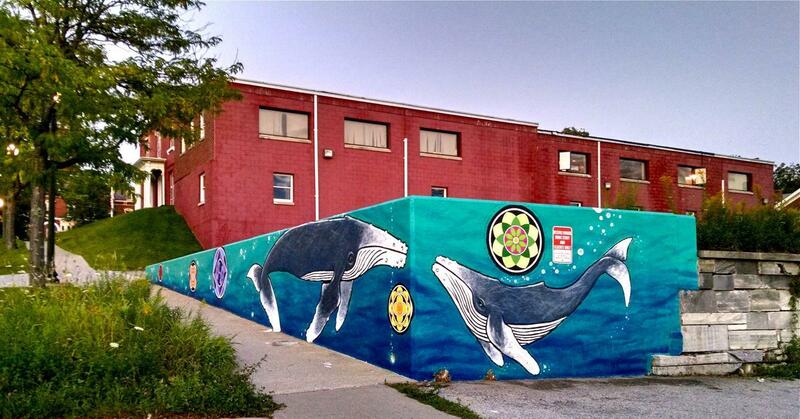 Persi Narvaez, an aritst from Lima, Peru, just completed his new mural in Rutland. Persi Narvaez painted this mural in Rutland two years ago. This mural by Kathryn Palmer-Wiegers was taken down to make way for Persi Narvaez's new work. But Palmer-Wieger is adding new panels and the mural will be installed in a new location this fall. This mural by Rutland artist Kathryn Palmer-Wiegers was installed by the Rutland Downtown Partnership in 2010. It’s hard to miss a painting that’s more than three stories high. In Rutland, a growing number of over-sized murals are coloring the downtown skyline. Persi Narvaez’s painted his first Rutland mural, a bright yellow splash of food and flowers, two years ago. He just finished his second, even larger work this month. This one in brilliant blue highlights the city’s architecture. 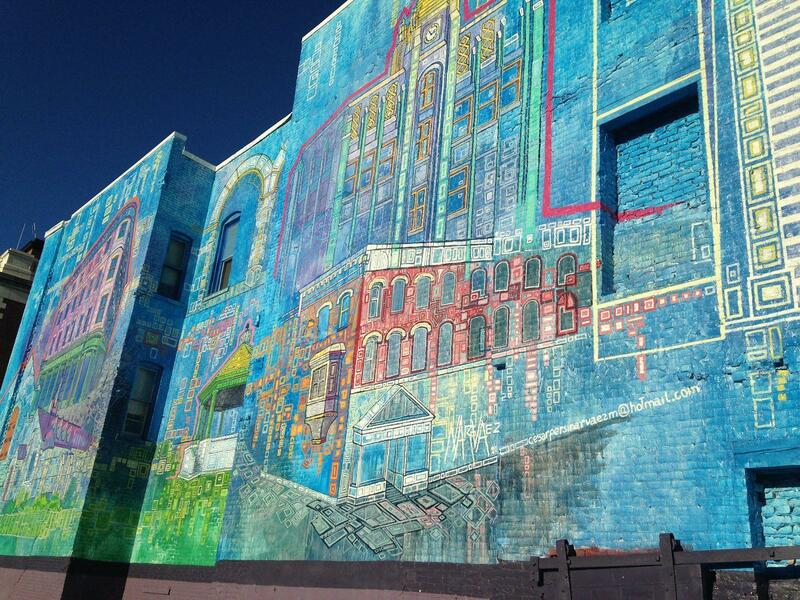 Persi Narvaez's 40-by-65-foot mural highlights the architecture of downtown Rutland. Margaret Barros, executive Director of the Chaffee Art Center, says the push to erect murals in city was begun four years ago by the Downtown Rutland Partnership. She says local property and business owners have come together with the arts community to find artists and fund them. To make room for Narvaez’s latest work, a mural by Kathryn Palmer-Wiegers of a farmer heading to market was taken down. But Barros says the artist is expanding that painting and it will be installed in a new location this fall. Another mural by Palmer-Wiegers adorns the side of Green Mountain Power’s Energy Innovation Center. Brian Sylvester's painting was sponsored by the Rutland Downtown Partnership. Shrewsbury resident Scott Garren likes them all. “I love the murals and I think they’re both a product of the rebirth that Rutland’s going through and a sign of energy from reinventing Rutland," he said. Barros says she hopes to involve area high school students in producing a mural at the Vermont fair grounds next year.